In March of 1943, the first U.S.-designed and -manufactured jet engine went on test for the Westinghouse Electric Corporation, 15 months after the signing of a contract with the U.S. Navy's Bureau of Aeronautics (BuAer). 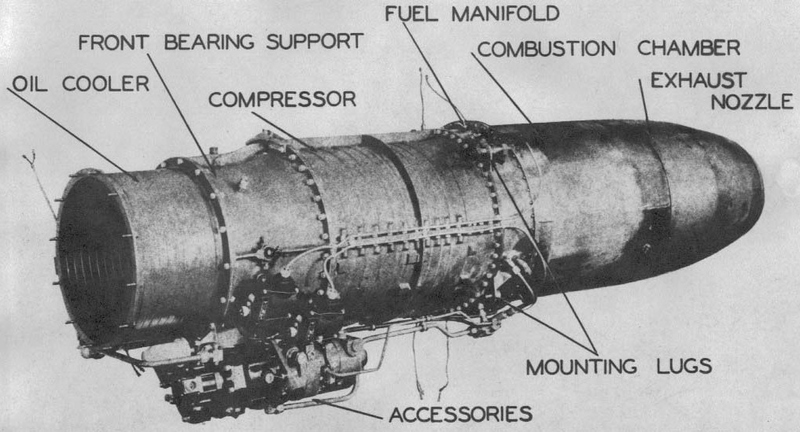 This first engine, with a 19-inch intake diameter, was designated the WE19A, had a thrust of 1130 pounds, and weighed 827 pounds. This photograph shows the improved version of the first engine, the W19XB, circa 1944. Original black and white diagram: Air Force Historical Research Agency, Air University, Maxwell Air Force Base, Montgomery, Alabama. Digital reproduction of original black and white diagram. Air Force Historical Research Agency, Air University, Maxwell Air Force Base, Montgomery, Alabama. Lagasse, Paul D. "The Westinghouse Aviation Gas Turbine Division 1950-1960: A Case Study of the Role of Failure in Technology and Business." M.A. thesis, University of Maryland at College Park, 1997, page 4. 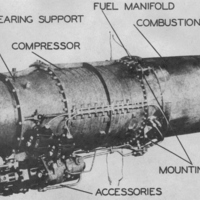 “Westinghouse Electric W19XB-2B Jet Engine.” RICHES of Central Florida accessed April 22, 2019, https://richesmi.cah.ucf.edu/omeka/items/show/7707.